Consider taking on a leadership role, and up your university experience to the nth degree! It’s a great way to give back while you build a repertoire of supervisory and management skills that will make your résumé sparkle. Peer Academic Leader (PAL): Volunteer to share what you’ve learned by working with St. Jerome’s Student Success Office. Help new students get a grip on university academics by facilitating study skills workshops and other student success and engagement programs. Student Activities Team (SAT): Join a team that provides diverse, interest-based, appealing programming for all SJU students throughout the school year. Be one of the smiling, welcoming faces that greet new students. Assistant Activities Coordinator (AAC): Act as a role model as you work with and oversee an SAT team to plan, promote, coordinate, and execute student activities. Senior Assistant Activities Coordinator (SAAC): Manage a team of upper year students while adding on broader administrative responsibilities to your duties as an AAC. Frost Leader: Work alongside a group of your peers to provide a week of unforgettable programming the first week back in the winter term. Frost Leader Advisor: Manage a small team and work to provide a week of inclusive, social, and exciting programming for returning students. Relay for Life Committee: Work alongside a group of your peers helping to organize Relay for Life events and projects, including finance, sponsorship, and fundraising. Relay for Life Chair: Lead and manage a committee of passionate and hard-working individuals in support of the Canadian Cancer Society. Projects will include "Movember" and culminate in Relay for Life in the Winter term. Co-Curricular Record (CCR) Committee: Work with a team to ensure SJU students know about the benefits of our CCR and act as an Involvement Advisor to encourage students to get involved in and outside the SJU community. Green Team: Join a team dedicated to working towards making the SJU campus as green as possible. Intramural Coordinator: Promote, schedule, and execute the intramural program, and collaborate with different programs at SJU to provide diverse programming. Intramural Referee: Facilitate and create an inclusive and safe environment for students to participate in sports on campus. Experience Guide (XG): Share your SJU story with prospective students and their families while conducting personalized tours. Enhance your community involvement, your knowledge of marketing and recruitment, and your personal and professional development. Chief Experience Officer (CEO): Improve your leadership skills, develop mentoring abilities, enhance your communication skills, and manage a small team, while promoting the SJU community to prospective students. Residence Coucil: Keep your floor up-to-date on the community's events, be the voice for what is served in the servery, and arrange floor activities to create a "floor family" of your own. Don: Guide, advisor, lifeline. Party planner, off-campus outing organizer. Go-to Wikipedia of residence and campus life, and your personal live-in support system. In your upper years, you can apply to become a Don and contribute to the high quality of SJU residence life. Community Advisor (CA): Take the next step up in residence leadership, and add broader operational and administrative responsibilities to your duties as an experienced Don. Student Campus Minister (SCM): Whatever your faith, demonstrate your commitment to building a spirit-based community through your daily interactions. Explore your own beliefs while you lead a team of students who prepare and present liturgies and activities. Student Music Director: Select the music, organize and run practices, and conduct the choir. St. Jerome’s Students’ Union Executive Team: Get involved in student governance and be a voice for SJU students. 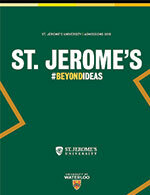 President: Manage and supervise a group of incredibly dedicated and passionate individuals while representing the student body at St. Jerome's. You will have the opportunity to sit on the Board of Directors as a student voice and be part of FEDS on main campus. Vice President and Administrative Officer: Call and hold meetings while working closely with the St. Jerome's Students' Union President, as well as connect with the students of the SJU community academically and socially. Chief Financial Officer: Increase your financial management while working as a dedicated member of the St. Jerome's Students' Union. Human Resources Officer: Coordinate and manage the campaign for the Members at Large Positions on the Students' Union, onboard and train new members, and act as an integral support to the team. Public Relations Officer: Strengthen your communication and public speaking skills, inform SJU students about all things election related, and act as the external voice for the Students' Union to keep the community up-to-date about what is going on. St. Jerome's Students' Union Members at Large: Get involved in student governance and be a voice for SJU students. Student Affairs Liaison: Act as a liaison between the Union Board and any student groups that arise within the St. Jerome's community, and partner with the university on outreach opportunities and community projects. FEDS Liaison: Collaborate with main campus on Students' Union initiatives, and sit in on FEDS meetings and report back to the Union. Academic Affairs Liaison: Act as a liaison between all academic affairs at the university and the Union Board with the opportunity to sit in on various committee meetings and participate in discussions. Business Operations Liaison: Work alongside the Chief Financial Officer on operational management of all joint ventures. As with all aspects of your university life, the St. Jerome’s advantage also means maximizing your leadership potential – because positions in Waterloo’s main-campus student organizations will also be open to you. So scout out the right fit – investing the time and effort to inspire others pays huge dividends!